But I never participate in Hacker News for a few reasons and I just was faced with these reasons again when I read the responses there to my blog post yesterday. 1. Programmers often have an attitude of “I can code, you can’t, so I am defacto better than you.” This often comes out in Hacker News comments. 2. Programmers love to bash people anonymously and then, in real life, they will come begging for PR for their companies so that they can survive to program again tomorrow. This comes out clearly in Hacker News. It’s one reason why I’m so anti anonymous comments lately. 3. Programmers love to put stuff into your words that you didn’t say so that their “algorithms” line up. Er, their world view. This clearly comes out in the comments you see there. 4. Programmers love to say stuff in their clubhouse that they won’t come over and say in yours. Look at how different the tone is in comments on Hacker News when compared to the comments on my blog or on Google+, for instance. At DLD I argued with “Moot,” the guy who runs 4chan. The real world knows him as Christopher Poole. I told him I far preferred Google+ for discussions than places that allow anonymous comments. He said he far preferred places that allowed anonymous comments. I told him that Techcrunch’s comments are 1000x better since they went with Facebook. He said they got 1000x worse. That they had lost their entertainment value and their vibrancy. My blog post, with its comments. Which do you like better? Which community do you identify best with? 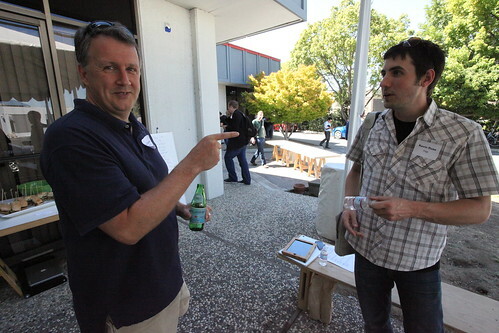 PHOTO CREDIT: That’s Paul Graham, founder of Hacker News, in front of Y Combinator’s headquarters, which is where he can often be found participating in the Hacker News community. He’s pointing at Kevin Rose, founder of Digg, which used to be where hackers hung out until Hacker News became their home. UPDATE: My Google+ commenters say I painted with too broad a brush. That is true. It’s just in reaction to the bashing I consistently get on Hacker News. Of course I have an ego. Of course I know most programmers aren’t like that. Your view may vary. Etc etc etc.